Goinlocal.co.uk, the community website and local business directory for postal district LS25, is now over nine years old. In that time it has grown its readership from zero to 14,000 visitors a month. A monumental achievement when you consider that our website is only promoted in LS25 and only uses search engine keywords relevant to the communities making up this postal district. Over 14 thousand families each month actually read the content of our pages instead of picking up a flyer or business directory from the letter box and dropping it straight in the bin unopened. Our website is packed with useful local information, telling everyone everything they want to know about LS25 and what is going on there, whilst at the same time letting them quickly reach the internet via a built in Google browser and links to the most popular websites. We encourage our readers to make it their homepage, a meaningful gateway to the internet and the way to find out about your business when they go in local. Why Use the Internet to Promote your Business? The number of people using the internet grows significantly year after year. It is not a flash in the pan, it is not the future, it is the now...Do you remember how thick the business directories used to be? Look at them now! The internet is where most people go to find out things. If your business is not represented on the internet then your customers will find someone else who is and you will lose a sale. Why Use goinlocal.co.uk to promote your business? Why is goinlocal important to your business, what do they offer? Well there were 168,378 good reasons in 2013. Local people, your potential customers, are visiting this website in ever increasing numbers to see what’s going on locally. If your business is not listed here how will they know about the excellent service you are offering? Do you have your own website? Have you spent hundreds of pounds on it and then found that people don’t even know you’ve got one? The secret of a successful website is to tell your customers you have one. You can do this by linking your website to goinlocal so that your potential, local customers can easily find it . Over 168,000 of your potential customers would have seen the link to your website if you had advertised with goinlocal in 2013. Why do your customers visit our website? 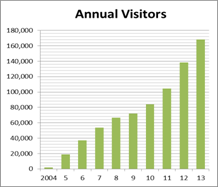 In our first full year 2005 we had 18,640 visitors to our site. In 2013 this has grown to 168,378 visitors. These are not readers scattered all over the world who will never buy anything from you, they are overwhelmingly local people, your potential customers. The promotion of the site and the content is aimed at local people. Our readership continues to grow by thousands each new year. Many visitors have, at the click of a button, made goinlocal their permanent homepage or simply added it to their favourites list. The news, events, job vacancies, ads and business listings are all local. The news pages are updated as and when local news happens. The event listings are up to date and for local events. The job vacancies are for local shops, factories and offices. The site is interactive. People write to our letters page with views about local issues. They recommend local businesses, qualifying them to appear on our ‘Recommended’ list. They submit local news and events information for inclusion on the website. They list new clubs and societies or update the details of existing ones. In addition the site is packed with useful information - local telephone numbers, popular websites, links to local websites, timetables, maps, weather reports, puzzles, how to contact your MP or councillor, in fact everything local and more…..
Take a look round www.goinlocal.co.uk today and see why so many people visit it.